I published my Lisbon Capsule one day after landing before I’d experienced much of the city, so I’ve been wanting to write a follow-up post on my trip to Lisbon. I didn’t do the best job researching before my trip. Instead, I chose to cram like a student before an exam, a few days before taking off. I would recommend looking into your phone data situation and getting a sim card on location. I got a NOS XL Livre unlimited data for one week for €15. It saved me because I’m terrible with directions. If you want to invest in a good travel guide to get the most out of your trip, I recommend the Time Out Lisboa guide. If you can, read up on the history and customs of Portugal. I read a very condensed summary of the history of the country and although short and superficial, it definitely added an extra layer to my trip. I’m no tour guide, so instead of detailing all the must-sees and must-dos of Lisbon, I’ll share my personal tips and the decisions I made that helped my trip be amazing. I had the help of a friend who picked the most amazing AirBnb for our trip. We stayed in the hip Bairro Alto neighbourhood, near Baixa-Chiado station at the intersection of the green and blue lines of the subway system. The neighbourhood was really bustling, and near lots of bars and shopping. For a full week, it wasn’t expensive at all, so don’t assume downtown means big bucks. I was quite surprised I didn’t take one cab in Lisbon. 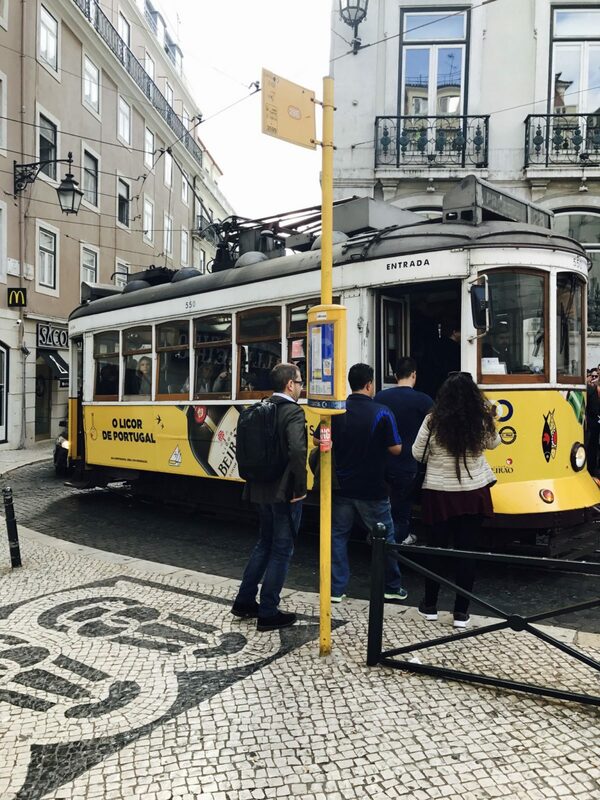 Although staying in a pretty central neighbourhood helped, it was also due to the quality of the Comboios de Portugal, the train and metro system. When you leave the airport, there is a metro station right there. It couldn’t be easier to spot. It’s the last stop on the northern end of the red line, and you can purchase a refillable card for €0.50 euro. Each trip is €1.40 or €2.80 if you purchase a return. Day passes are €6.00. I was in Lisbon for one week, and filled my pass for about €17. Forget the saying “to-go” when in Lisbon. When you walk into a café and pastry shop, you might see a lineup of people waiting to be served. Don’t wait in line, unless you need pastries to go. The secret is these cafés have a two-tiered system. You might pay slightly less for pastries if you get them in bulk and to go, but if you sit down, you’ll be immediately served (no waiting in line!) and you can order your treats, drink your coffee calmly, and THEN order whatever you want to take away before you settle the bill at the till. Speaking of pastries…they are everywhere and they are all delicious. The most popular ones are the Pasteis de natas, sweet custard tarts, but some of my favourite alternatives had inventive recipes with almond paste. I made a joke there would be a pastry shop at my gate flying home, and sure enough, there was a cart selling (ridiculously overpriced) pasteis de natas right there. Belèm has the best and most authentic ones, apparently, but I didn’t make it to that neighbourhood, so I sampled the ones pretty much everywhere else I went. No joke, I had one a day. It’s not so much that everything is far, or there is no other transportation…but everything is uphill…both ways. Just kidding. In all seriousness,the inclination of most streets and the ubiquitous cobblestones make walking around a bit tiring. When researching for my Lisbon Capsule, everyone said heels are absolutely impossible, and now I see why. Be careful on rainy days, since the wet stones can get slippery. One of the most defining styles of Lisbon are the azulejos — the decorative tiles along most street, floors, walls, and ceilings. There is a museum of the Azulejos, if you’re really into them, but for me, the city itself was enough. Sintra is a town and a municipality in the greater Lisbon region. It’s where the nobility and wealthy elite would build their castles, summer homes, and mansions, and is now a UNESCO world heritage centre. From Moorish ruins dating back to 6th century B.C. to the more modern early 20th century Quinta da Regaleira, the architecture has a huge variety of styles and paints a living portrait of the history and fashions of Portugal. It’s definitely a day trip worth of things to see, or more, if you can take the time. To get there, you can take a 40 min train from the Rossio station near Restauradores subway station on the blue line. They leave every 30 min roughly. You can pay for the train using the refillable metro card, and a round-trip is €4.30. Once you’re there, you have two options for visiting the castles of the region. The 434 bus route hits five locations, including the colourful Palacio de Pena, and the other bus, the 435, visits the rest, including the Monserrate Palace and the Quinta da Regaleira. A €5 bus ticket will allow you to take one of these buses in a full loop. You can hop on and hop off at each of the locations on the route and then catch it back to the train station. Or, for €12, take any one of the buses, at any time, all day. Wine is cheap and the food is incredible. You walked uphill all day, you’ve earned it! Most days I ate a simple breakfast at home, snacked on free food and pastries while at the conference or wandering around. This meant by dinner I was ready for a real meal. Two standout places were definitely the Mercado da Ribeira and Pharmacia (for which you’ll need reservations). For drinks later, Pensão Amor is a pretty cool lounge. The mercado is the nicest food court you’ll ever visit. It’s as if the nicest restaurants in Lisbon were offered a take out counter in a posh dining hall, which means wall-to-wall fine-dining, with the casual atmosphere of 40 long communal tables. No disposable plates here. Everyone has real place settings and wine glasses, and children are welcome. You don’t need to be fluent in Portuguese, but a simple thank you — obrigado if you’re a man or obrigada if you’re a woman, will be well appreciated. Com licenço/a, or excuse me, will be more useful than you’d expect. I recommend a quick refresher on pronunciation, because you might think your Spanish or Italian will help you, but it’s a different language and that might trip you up. FYI, tipping is not really the custom, so a 2% or rounding up is fine. 10. Enjoy and take it all in! I had such a blast in Lisbon, I can’t recommend it enough. What I loved most is how Portugal preserves the past but embraces the future. The mix of old and new is quite remarkable and organic. Restoration projects are thoughtful, new buildings are intentional and sensitive to surrounding architecture, and I found the general vibe to be very creative and forward-thinking compared to other European centers.